The different expression level of Dickkopf-1 (DKK-1) in different cancers shows that the function of DKK-1 depends on the histological type of the cancer cells and the tissue microenvironment. To our knowledge, the serum expression level of DKK-1 in breast cancer is little known. Blood samples from 125 consecutive patients diagnosed with breast cancer and 53 control subjects from March 2008 to August 2013 were investigated. Serum DKK-1 expression levels were measured by enzyme-linked immunosorbent assay (ELISA). The overall survival (OS) and relapse-free survival (RFS) analyzed by log-rank test, and survival curves were plotted according to Kaplan–Meier. The mean serum level of DKK-1 in patients with breast cancer was 4.99 ± 1.50 ng/mL, and was significantly higher than that in healthy individuals (1.88 ± 0.81 ng/mL, P < 0.001). DKK-1 level correlated significantly with TNM stage (P = 0.009), tumor grade (P = 0.02), lymph node metastasis (P = 0.001), and expression of HER2 (P = 0.002). The DKK-1 expression level was classified as high or low in relation to the median value, and patients with breast cancer (n = 125) were divided into a high expression group (n = 63) and a low expression group (n = 62). The Kaplan-Meier method for survival analysis showed that the patients with a high serum DKK-1 level had a poorer OS (48.7% vs. 81.3%, p = 0.01) and RFS (24.3% vs. 71.6%, p = 0.003) than those with a low expression level. The multivariate Cox regression analysis indicated that serum DKK-1 level was independent prognostic factors for OS and RFS. Serum DKK-1 level can be used as a noninvasive biomarker for the prognosis of breast cancer. Breast cancer is the most common malignancy and is the leading cause of cancer death in females worldwide, accounting for 23% of the total cancer cases and 14% of the total cancer deaths . Invasion and metastasis are the major features of malignant tumors and result in poor prognosis of patients. The invasive abilities of cancer cells are the critical parameters of the metastatic cascade . Therefore, better understanding of the prognosis and metastasis associated factors and the underlying mechanisms would help to improve patients’ prognosis. Although some pathological factors, including estrogen receptor (ER), progesterone receptor (PR) and c-erbB-2 (HER2), have been widely used as a reference in clinical diagnosis and treatment, their prognostic value for breast cancer still has certain limitations. Therefore, it is important to identify reliable prognostic markers in clinical practice for the treatment of breast cancer -. Dickkopf-1 (DKK-1), a secreted protein, is known as a negative regulator of the Wnt signaling pathway . DKK-1 binds to lipoprotein receptor-related protein-5/6 (LRP5/6) and blocks interaction with Wnt-1, resulting in β-catenin degradation and retardation of proliferation -. The expression and roles of DKK-1 are different in various cancers, current studies have reported that overexpression of DKK-1 is found in many malignant tumors, including lung cancer, esophageal carcinomas, cervical cancer, and hepatocellular carcinoma (HCC), indicating a potential oncogenic function of DKK-1 -. However, paradoxically, the expression of DKK-1 was down-regulated significantly in human colon cancer, gastric cancer and melanoma -, suggesting that the function of DKK-1 may be different in different types of cancers. In spite of these studies, there little has been reported on the significance of DKK-1 expression in breast cancer progression and prognosis. In the present study, serum expression level of DKK-1 of 125 patients diagnosed with breast cancer was examined using enzyme-linked immunosorbent assay (ELISA), and the correlations between serum DKK-1 expression and clinicapathological factors were explored. Furthermore, the prognostic role of DKK-1 in breast cancer was evaluated using Cox regression and Kaplan-Meier analysis. Blood samples from 125 consecutive patients diagnosed with breast cancer who underwent surgery at the Department of Breast and Thyroid Surgery, Weihai Municipal Hospital from March 2008 to August 2013 were investigated. 53 control subjects were randomly selected among individuals receiving health examinations at the Health Examination Center of Weihai Municipal Hospital, any of these subjects who had a history of cancer were excluded from the study. Blood samples were collected from the patients at the time of diagnosis, before surgery. The demographic and pathological data, including age, gender, and the tumor stage, were obtained by a review of the patients’ medical records. The protocol for this study was approved by the ethics committee of Weihai Municipal Hospital, and written informed consent was obtained from each participant. A structured questionnaire was administered by well-trained interviewers to collect information on demographic and anthropometric characteristics of the enrolled subjects. Venous blood samples were collected into anticoagulant-free tubes and centrifuged to obtain serum samples, which were stored at −80°C until they were assayed. Serum DKK-1 expression levels were measured by enzyme-linked immunosorbent assay (ELISA) with immunoassay kit (Miltenyi, Germany) according to the manufacturer’s directions. The optical density (OD) at 450 nm was determined. The standard curves were established with OD450 as Y axle and the concentration of standard substance as X axle. The level of protein was obtained through standard curve. Results are reported as concentration of DKK-1 ng/ml in samples. Numerical variables were recorded as means ± SD and analyzed by independent t-tests. Categorical variables were presented as rates and analyzed by using the chi-square test or Fisher’s exact test. The relapse-free survival (RFS) was defined as the interval between the operation and the date that tumor recurrence or metastasis were diagnosed. Overall survival (OS) was defined as the interval between the operation and the date of death of the patient. The OS and RFS analyzed by log-rank test, and survival curves were plotted according to Kaplan–Meier. Univariate Cox regression was performed on each clinical covariate to examine its influence on patient survival. Final multivariate models were based on step-wise addition. P-values <0.05 were considered as statistically significant. Statistical analyses were performed using SPSS 13.0 soft-ware (Chicago, Ill., USA) and GraphPad Prism 5 (GraphPad Software Inc., CA, USA). The DKK-1 levels in serum from patients with breast cancer (n = 125), and from healthy individuals (n = 53) were detected by ELISA. 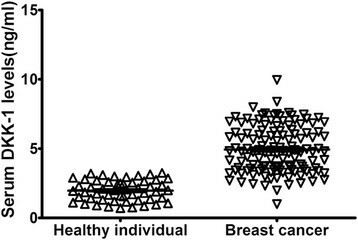 The mean serum level of DKK-1 in patients with breast cancer was 4.99 ± 1.50 ng/mL, and was significantly higher than that in healthy individuals (1.88 ± 0.81 ng/mL, P < 0.001, shown in Figure 1). DKK-1 levels in serum of breast cancer and healthy individuals. The mean serum level of DKK-1 in patients with breast cancer was 4.99 ± 1.50 ng/mL, and was significantly higher than that in healthy individuals (1.88 ± 0.81 ng/mL, p < 0.001). The DKK-1 expression level was classified as high or low in relation to the median value, and patients with breast cancer (n = 125) were divided into a high expression group (n = 63) and a low expression group (n = 62). The relationships between serum DKK-1 levels and clinicopathological characteristics of patients with breast cancer were analyzed (shown in Table 1). Serum DKK-1 levels correlated significantly with TNM stage (P = 0.009), tumor grade (P = 0.02), lymph node metastasis (P = 0.001), and expression of HER2 (P = 0.002). There was no significant correlation of serum DKK-1 levels with age (P = 0.61), histological type (P = 0.11), expression of ER (P = 0.09), expression of PR (P = 0.12), family history of breast cancer (P = 0.07), radiation therapy (P = 0.39), chemotherapy (P = 0.31), and menopausal status (P = 0.45). ER = estrogen receptor; PR = progesterone receptor; HER-2 = c-erb B-2. Considering that serum DKK-1 levels were significantly correlated with TNM stage, tumor grade, and lymph node metastasis, we hypothesized that serum DKK-1 level might affect the prognosis of breast cancer patients. To confirm this possibility, the DKK-1 expression levels and the prognosis of patients with breast cancer were analyzed by using the Kaplan–Meier method. The Kaplan-Meier method for survival analysis showed that the patients with a high serum DKK-1 level had a poorer OS(48.7% vs. 81.3%, P = 0.01; Figure 2A) and RFS (24.3% vs. 71.6%, P = 0.003; Figure 2B) than those with a low expression level. The multivariate Cox regression analysis indicated that serum DKK-1 level (HR = 2.19; P = 0.002), TNM stage (HR = 4.24; P = 0.01), and lymph node metastasis (HR = 3.12; P = 0.007) were independent prognostic factors for OS, while serum DKK-1 level (HR = 3.97; P < 0.001), tumor grade (HR = 2.98; P = 0.009), and expression of HER2 (HR = 2.29; P = 0.02) were independent prognostic factors for RFS (shown in Table 2). Survival analysis of the serum DKK-1 levels with overall (A) and relapse-free survival (B) of patients with breast cancer after surgery. Over the past few years, an increasing number of studies have focused on exploring the risk factors of breast cancer in order to prevent it. Up to now, many molecular markers have been used for prognosis of breast cancer patients, including Ki-67, Bcl-2, HER-2, ER, PR, P53, PAR1, and FGFR1 -. These markers are all correlated with patient outcomes. However, the biological potential of breast cancer is difficult to predict completely with the use of current standard risk factors. Therefore, more persuasive prognostic indicators should be explored for the comprehensive evaluation of breast cancer patients. DKK-1, DKK-2, DKK-3, and DKK-4, together with a special DKK-3 related protein termed Soggy (Sgy), compose a family of DKK-related genes. DKK-1, DKK-2, DKK-3, and DKK-4 contain 2 discrete cysteine-rich domains, in which the positions of 10 cysteine residues are supremely conserved among family members. DKK-1 and DKK-4, but not DKK-2, DKK-3 or Sgy, have been shown to suppress the Wnt-induced secondary axis induction in Xenopus embryos ,. DKK-4 was found to show high specificity for gastric cancer . DKK-1, which was involved in some aspects of embryonic development, was detected in mature human tissues, mainly in the placenta. Specifically, Wnt-1 protein binds to the frizzled receptor and the low-density lipoprotein receptor-related protein-5/6, triggering signals important for proliferation via β-catenin. DKK-1 binds to low-density lipoprotein receptor-related protein-5/6 and blocks interaction with Wnt-1 resulting in β-catenin degradation and effects on proliferation . Other result showed that DKK-1 functioned not only as an antagonist of the Wnt/β-catenin pathway but also as an agent that could up-regulate other Wnt signaling pathways if the requisite Wnt/receptor combinations were available. DKK-1 also can suppress cell growth and induces apoptotic cell death by activating the c-Jun N-terminal kinase pathway . The expression and roles of DKK-1 are different in various cancers, current studies have reported that overexpression of DKK-1 is found in many malignant tumors, including lung cancer, esophageal carcinomas, cervical cancer, and HCC, indicating a potential oncogenic function of DKK-1 -. However, paradoxically, the expression of DKK-1 was down-regulated significantly in human colon cancer, gastric cancer and melanoma -. Therefore, the different function of DKK-1 in different cancer types depends on the histological type of the cancer cells and the tissue microenvironment. However, to our knowledge the expression of DKK-1 in breast cancer is little known. In the present study we investigated the expression of DKK-1 in patients’ serum to establish if DKK-1 can be used as a novel prognostic biomarker in human breast cancer. In this study, we had three findings. Firstly, the serum levels of DKK-1 in patients with breast cancer was significantly higher than that in healthy individuals, and high serum levels of DKK-1 was found to significantly correlate with TNM stage, tumor grade, lymph node metastasis, and expression of HER2. Secondly, Kaplan–Meier analysis showed that breast cancer patients with high serum DKK-1 expression level had distinctly shorter overall survival and relapse-free survival. Thirdly, univariate and multivariate analyses showed that the serum DKK-1 level was independent prognostic parameter of overall survival and relapse-free survival in breast cancer patients. All the results suggested that serum DKK-1 level was befitting to predict prognosis of breast cancer patients after surgery. In conclusion, our results indicated that serum DKK-1 was overexpressed in breast cancer and high expression of DKK-1 was associated with poor prognosis. The data suggest that serum DKK-1 may be a useful molecular marker in breast cancer. SJZ designed the study and drafted the manuscript; SJZ, SRZ, XQY, CXQ, and ZLW carried out the expertiments and performed the data analysis. All authors read and approved the final manuscript.